The Angels Landing hike can be found in Utah’s Zion National Park, which is about a 2.5-3 hour car ride northeast from Las Vegas. The park is situated along the Virgin River which has carved out Zion Canyon over millions of years. The closest town to stay in while visiting Zion is Springdale, it’s a great little town with lots of choice for accommodations & meals out. As you enter Zion Canyon, Angels Landing looms ahead of you in the distance jutting out from the canyon wall. If you’ve been planning on hiking it, you’re likely a little anxious at this point based on what you’ve read – very dangerous, those with a fear of heights should not attempt, # of deaths, etc. The hike starts on a wide paved path at the base of the canyon wall after you cross a bridge over the Virgin River. The path gradually get steeper and eventually becomes switchbacks up the canyon wall. A tip would be to get an early start (7-8am) as this stretch is in the open sun and could be scorching by noon, as well as very busy. After the switchbacks, the trail flattens out as you make your way into Refrigerator Canyon which is shaded and cool. You’ve now reached Walter’s Wiggles, which are a series of 21 very steep switchbacks that lead to a beautiful lookout point and the start of the Angels Landing ascent. This is where it does get a little dangerous, the remaining 0.5 mile is a hike/scramble with the aid of a trusty chain to the Angels Landing lookout. This section can take up to an hour, and should be done slowly and with a lot of caution. There are some sections that are quite sketchy and test your nerves, but the pay-off at the end is definitely worth it. The round-trip will take anywhere from 3-5 hours depending on how quick you’re walking and how many breaks you’ll take. 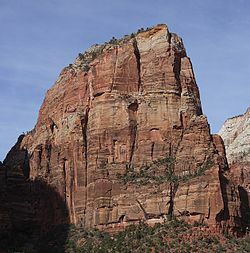 Make sure to take a nice long break at the lookout before the final push to Angels Landing, the views are spectacular. I’d recommend a good pair of shoes & a Camelback for easy access to your water. Here’s a great video that shows the whole trek. Enjoy!